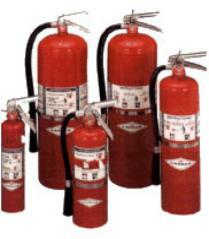 Dry chemical extinguishers are available in a variety of types and sizes. These are usually the best economical choice for compliance applications. The multi-purpose dry chemical models utilize a specially fluidized and siliconized mono ammonium phosphate dry chemical that chemically insulates Class A fires by melting and coating the surface to which it is applied. It also smothers and breaks the chain reaction of Class B fires and is a non-conductor of electricity. 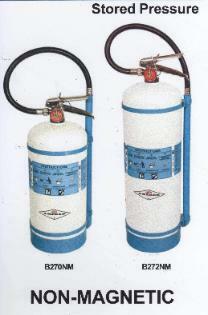 Excel Line(TM) nylon-valved fire extinguishers with aluminum cylinders are best suited for light commercial applications. Carbon Dioxide fire extinguishers discharge a white cloud of "snow" which smothers a fire by eliminating its oxygen. 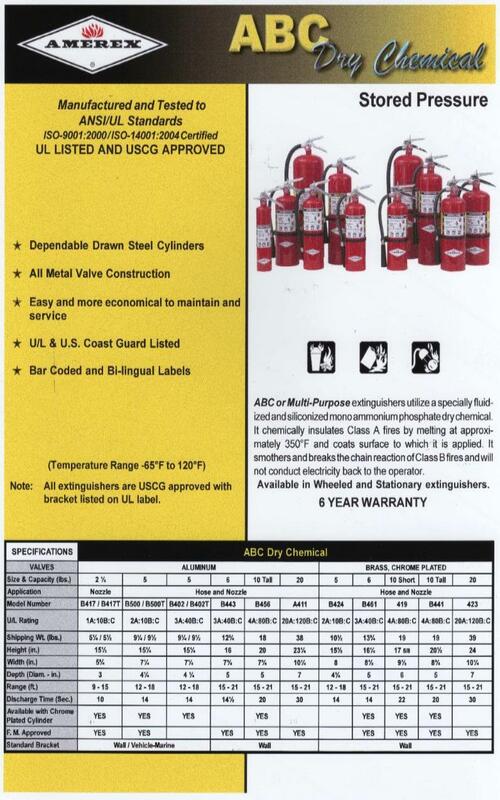 It is effective for Class B flammable liquid fires and is electrically non-conductive. Carbon Dioxide is clean, non-contaminating, odorless gas safe for use on valuable equipment.These units are ideal for areas where contamination and/or clean-up are a concern, such as data processing centers, labs, telecommunication rooms, food storage and processing areas. Halotron I is a "Clean Agent" HCFC discharged as a rapidly evaporating liquid which leaves no residue. It effectively extinguishes Class A, and B fires by cooling and smothering and it will not conduct electricity back to the operator. Halotron I is intended for use in areas formerly protected by Halon 1211 hand portable extinguishers such as computer rooms, telecommunications facilities, clean rooms, data storage areas, aircraft, boats and vehicles. Available in 1 1/2, 2 1/2, 5, 11, and 15 1/2 pounds. 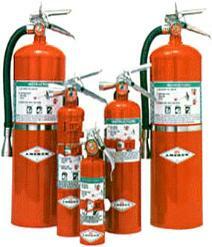 Water Mist is the ultimate extinguisher for Class A Fires, and where potential Class C (Electrical) fire hazard exists. The fine spray form the unique misting nozzle provides safety from electrical shock, greatly enhances the soaking and cooling characteristics of the agent and reduces scattering of burning materials. The Amerex Water Mist Extinguishers contain de-ionized water making them the best extinguishers for protection of hospital environments, books and documents, telecommunication facilities and clean room manufacturing facilities. 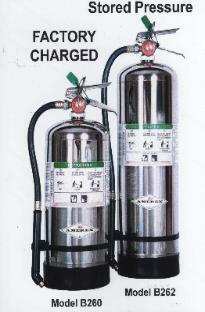 The Amerex Fire Extinguishers are easy to use, maintain and service. Wet Chemical, also know as type K, extinguishers: are the best restaurant kitchen appliance hand portable fire extinguishers you can purchase. 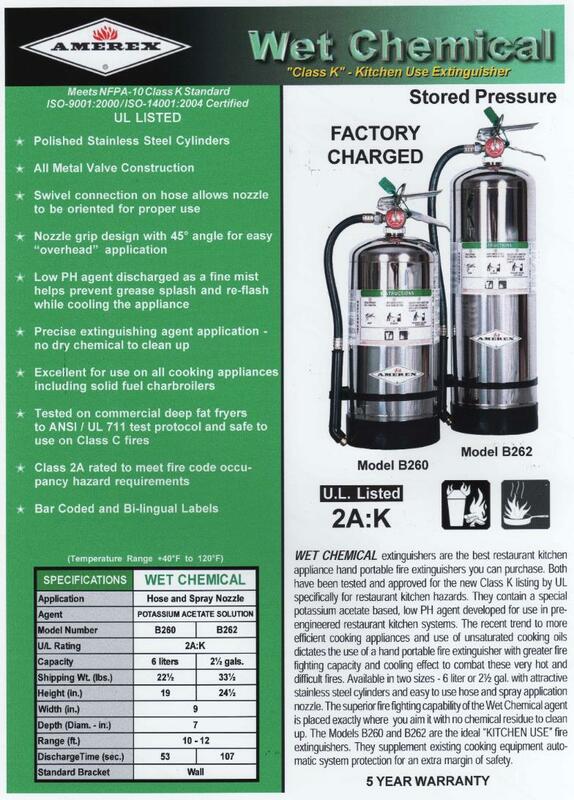 Both have been tested and approved for the new Class K listing by UL specifically for restaurant kitchen hazards. They contain a special potassium acetate based, low PH agent developed for use in pre-engineered restaurant kitchen systems. The recent trend to more efficient cooking appliances and use of unsaturated cooking oils dictates the use of a band portable fire extinguisher with greater fire fighting capacity and cooling effect to combat these very hot and difficult fires. Available in two sizes - 6 liter or 2 1/2 gal. 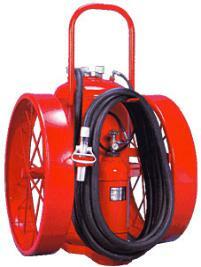 with attractive stainless steel cylinders and easy to use hose and spray application nozzle. The superior fire fighting capability of the Wet Chemical agent es placed exactly where you aim it with no chemical residue to clean up. 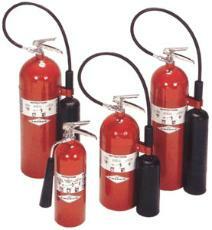 The Models B260 and B262 are the ideal "KITCHEN USE" fire extinguishers. They supplement existing cooking equipment automatic system protection for an extra margin of safety. Contains a special blended Sodium Chloride based dry power extinguishing agent. Heat from the fire causes it to cake and form a crust excluding air and dissipating heat from burning metal. 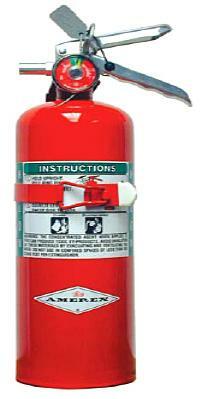 Metal fires involving magnesium, sodium, potassium and sodium - potassium alloys can be successfully extinguished with this extinguisher. 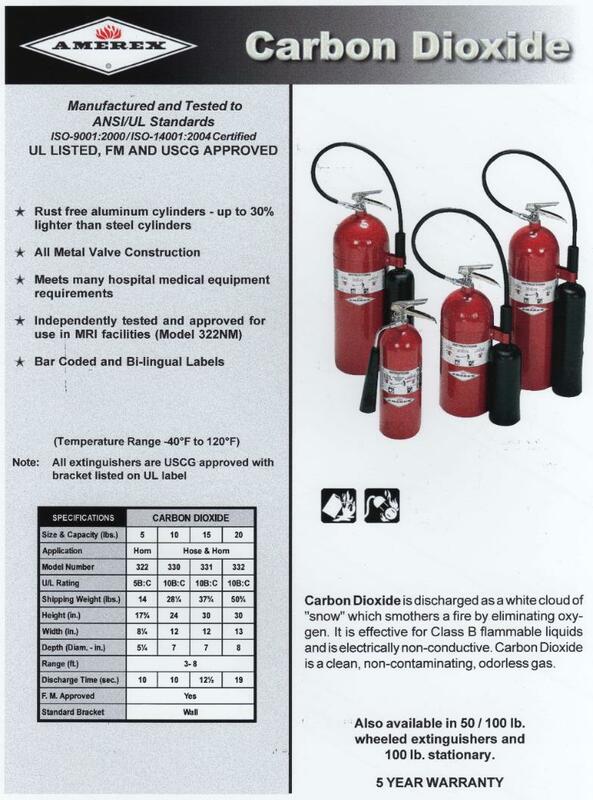 There is data showing that zirconium, uranium, titanium and powered aluminum fires can be controlled and extinguished with this unique extinguisher. AVAILABLE IN 150 LB. WHEELED OR STATIONARY. 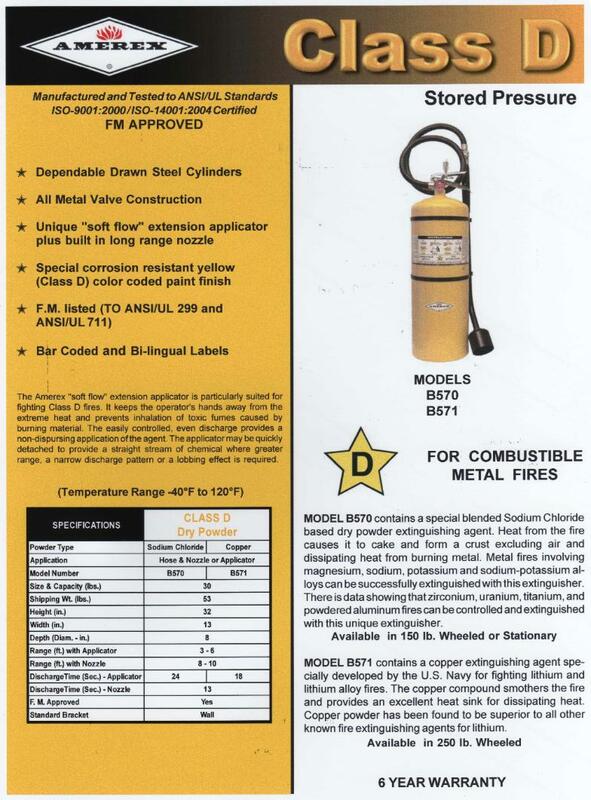 MODEL B571 contains a copper extinguishing agent specially developed by the U. S. Navy for fighting lithium and lithium alloy fires. The copper compound smothers the fire and provides an excellent heat sink for dissipating heat. Copper powder has been found to be superior to all other known fire extinguishing agents for lithium. foam and Class D models. 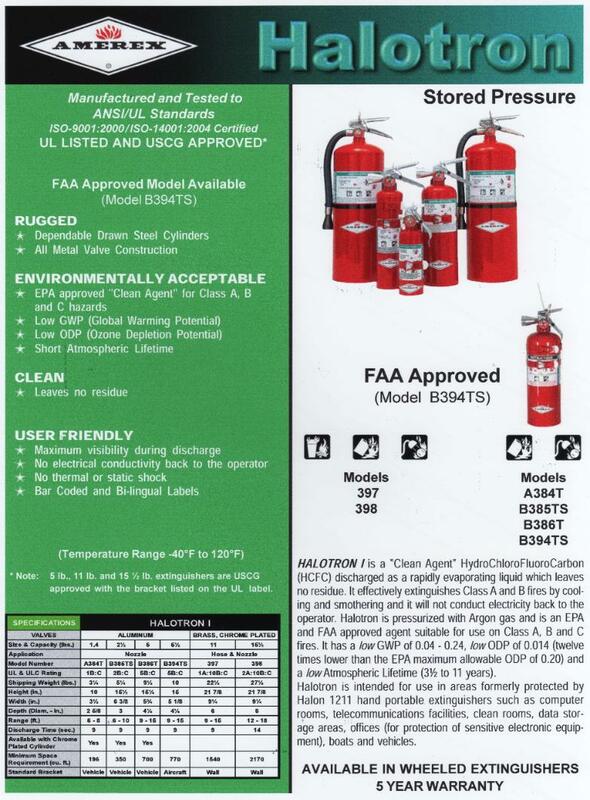 HALON 1211 is a liquified gas, pressurized with nitrogen, which discharges as a vapor causing no cold or static shock and no impairment of the operator's vision. This "CLEAN" agent quickly penetrates difficult to see and hard to reach areas and leaves no residue. It is recommended for protection of delicate, sensitive and expensive computers, electrical equipment, tapes and film, automotive and aircraft engines, laboratory chemicals and equipment. Quality industrial grade hardware, "CLEAN" agent, light weight, good discharge range and excellent fire extinguishing ability. Copyright © 2019 Raider Fire Protection.